Glow Wars can be added to any Classic, Deluxe or Ultimate Party. 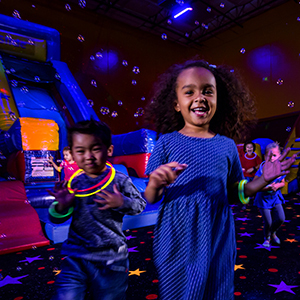 This experience includes Glow Lighting, Glow Necklaces the use of up to 15 Glow Ball Guns that are a blast. The guns are used in our laser lit glow room. The Kids and parents are easy targets and the soft pong balls glow in dark as they soar through air. Call us to learn what princess, kitty, super hero, bat, spider, space trooper and turtle like characters are available and how to secure one for your next party. Check out our inside Pump It Up Tab to see several of our characters. Our Balloon drops are here!!!!! We have 3 nets with 150 plus balloons in each. 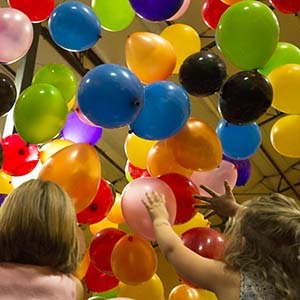 The balloon drops are performed with a dance competition or games like Simon says so the unsuspecting kids are totally surprised. We can only accommodate 3 Balloon drops per day, so reserve early. 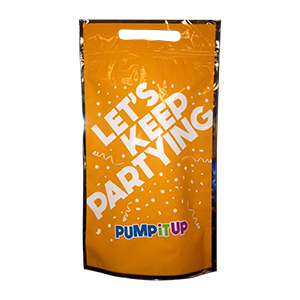 Bring home one of our goodie bags to keep the party going! Includes: Thunderstick, harmonica, pull back racer and a puzzle ball. Not Currently Available. This bag includes a variety of fun toys and novelties to enjoy! Includes a Yoyo, Spin Top, mini ball, stamp, blow up punching ball, toy flute and 4 candies.